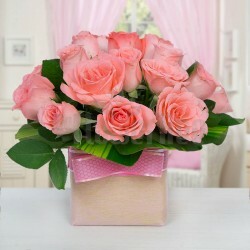 Whether wrapped in paper or just handed out in the raw form, Flowers are always wonderful to be received. 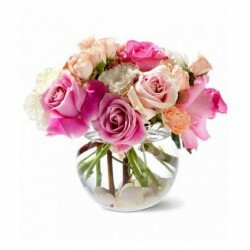 If you are planning to send Flowers to a loved one, why not decorate them in a beautiful Glass Vase? 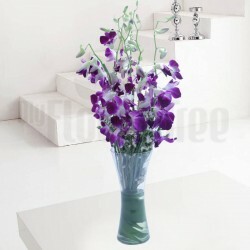 Send these beautifully decorated Flowers in Glass Vase and make someone's ambiance better than before. The association of flowers with love, affection and passion is nothing new. 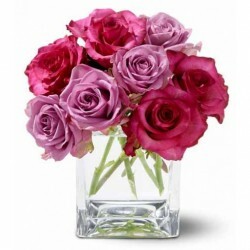 Flowers have served as objects of endearment through the ages and in various cultures. In fact, is there a better approach expressing the warmth, care, joy, dedication and passion of love than the soft, beautifully colored, fragrant flowers?! We think not! A flower here, a flower there, all in the vase together! 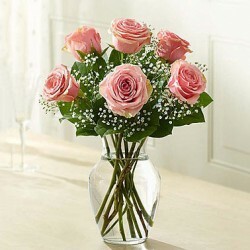 A vase arrangement of flowers seems to speak the language of love better than words can. 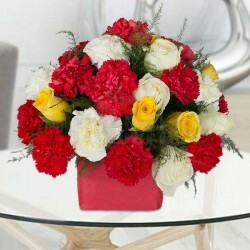 Be it for wooing your lady love or pacifying your angry better half, a heart shaped flower arrangement always does the job; and that too in the most alluring way. With the advancement of civilization, man began to realize and thereby embrace the richness of art. Art came to humans in all forms. One of the most prime of these forms of art was flower arrangement. People began relating specific sentiments to a particular number, color, species or arrangement of flowers. 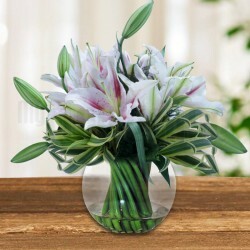 This gave way to using flowers in vase arrangements, flower bouquets, girdles and so on as symbols of unspoken sentiments.Creative flower arrangements were in great fashion throughout theVictorian society, mainly used for expressing feelings that could not be displayed by any other means to the recipient. 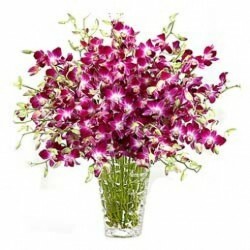 Flowers have had numerous associations which have even been depicted in many works of art and literature. Popular writers like William Shakespeare, Jane Austen, and Emily Bronte were a few among those whose works contained references of flowers and feelings. But did they ever foresee the brilliance that heart shaped vase arrangements will emanate?! We doubt it. Red roses, which have been the symbols of pure love and passion through time immemorial, appear more exquisite when presented artfully in heart shaped arrangements.Shy in nature or fearful of rejection? No issues. Let the 'flowers in the vase' do the talking. Planning to propose your special friend and cannot find the right words to do it? 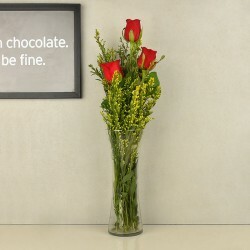 A lovely vase arrangement of flowers can certainly help. Find it difficult to muster the courage to walk up to that long-time crush and expressing yourself? Here's your solution. 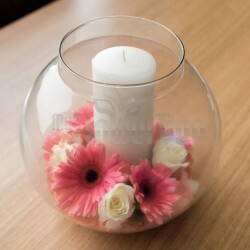 Send a glass vase arrangement in a heart shape to the person with a personal note, and let your 'special one' know how earnestly you adore him/her. 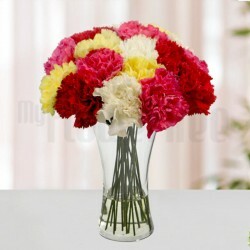 Make special occasions more special by sending attractively arranged birthday bouquets to your beloved. 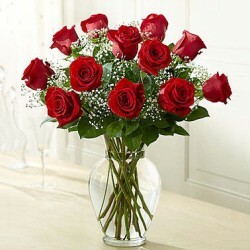 At the same time, the heart shaped bunch of 25th anniversary flowers help add more charm to your celebrations. Want to make it up to your angry better-half in a way that she melts? 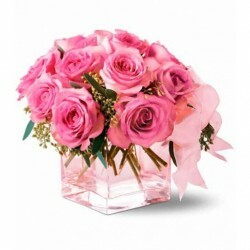 Get her an exquisite collection of flowers and let it work its charm. At MyFlowerTree, we bring you a wide assortment of freshly plucked, manually arranged flowers to convey your love and good wishes to the special ones in your life. Considering the varying requirements that different customers can have, we offer flowers in several varieties, collections and arrangements. The heart shaped flower arrangements are one of the most popular and frequently purchased items in our collection. Spread across 408 cities within the nation, we also offer express delivery services. 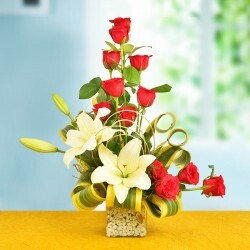 Looking for an online flower delivery store in Bangalore to deliver on the same day you have placed an order? Now you know just where to look. Products in this category have been rated 4.8 out of 5 based on 141 reviews.